RT investigates reports of hunger strikes at various immigrant detention centers in the UK. Asylum seekers have reached out to journalists, lawyers and rights champions complaining of drastic conditions at prison-like facilities and indefinite detention. 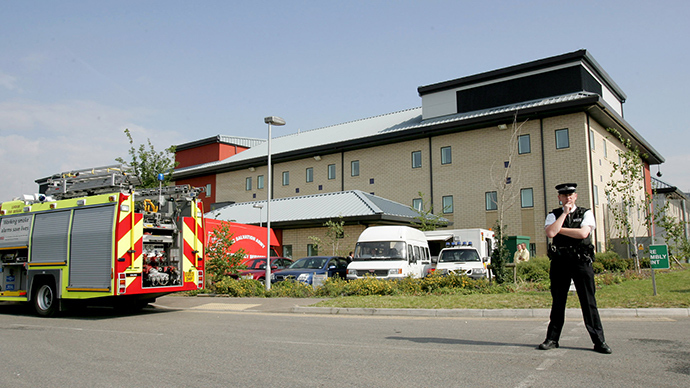 An asylum seeker who is being held at Colnbrook detention center, Abimbola Olanweju, told RT that it is almost impossible to successfully claim asylum. Several dozen asylum seekers have reportedly been sent back to Pakistan, despite facing death threats at home. While the UK Home Office refuses to give any information on deportation flights, one inmate told RT’s Laura Smith that there was a charter flight which left for Pakistan with some 50 men on board from Harmondsworth facility. Smith wants the delegation to not only include representatives of the trade union body, but also those of Scottish churches and the Scottish Refugee Council. “The STUC and other Scottish civil society organisations we have contacted are very concerned at reports of large numbers of detainees refusing food at the Dungavel detention centre,” Smith said in a statement. RT’s Harry Fear witnessed two buses with people inside leave Harmondsworth immigrant removal center overnight. Earlier, inmates from the center said they would be “forcefully” put on a charter flight to Pakistan, despite their fears of facing persecution there. One of the inmates, 43-year old Abbas Haider, a Christian who believes he will be persecuted in Pakistan for his faith, spoke to RT by phone. More than a hundred detainees are expected to leave the Harmondsworth immigrant removal center on Tuesday and board a charter flight to Pakistan, detainee Abbas told RT in a phone conversation. He added that most of them don’t want to leave and are “forced” to do so. If someone resists a lot than they give “injections” after which the body is “paralyzed,” he said. The 43-year-old Pakistani national has been detained in the immigrant removal center near London since January 26. RT spoke to one of the detainees from Mortan Hall who asked not to be named. He said that he has been in Morton Hall for one year. Contemplating the hunger strike, he said that the number of strikers is currently between 10 and 20 people. “There is a thick veil of secrecy surrounding these facilities,” RT’s Anastasia Churkina reported from the site. RT is trying to investigate the unconfirmed reports which are coming out from several immigrant detention centers in the UK.